Explanation: What are these unusual lumps on Mars? As NASA's robotic Curiosity rover continues rolling across Mars, it is now approaching Murray Buttes. 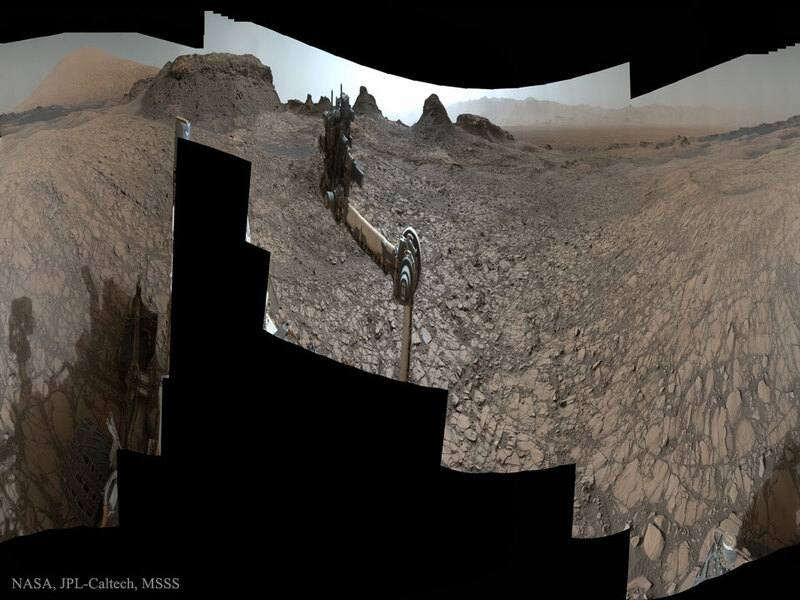 Several of the 15-metre high buttes are visible ahead in this horizontally compressed 360-degree across image taken inside Gale Crater earlier this month. The buttes are thought similar to Earth buttes in that they are capped with dense rock that is relatively resistant to erosion. In the image centre is Curiosity's "arm" and "hand" used to examine rocks up close, drill into rocks, and collect samples. Curiosity has reached its four year anniversary on Mars and has been cleared to spend the next two years further exploring the slopes of Mount Sharp, the peak of which is the distant light-coloured structure visible on the far left.